I first started the “Ugly Truths” series in July of 2015! That seems like forever ago and I can’t believe I’m continuing with the same theme. I must like it, right?! If you want to read the background on the Ugly Truths, then check out that very first post. 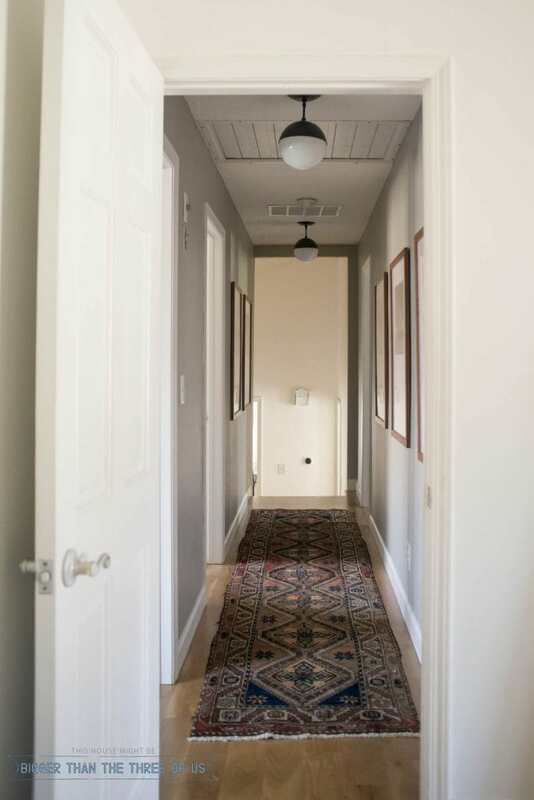 Basically, pictures and blog posts don’t always tell the “whole story” of what a room looks like. So, I started this series years ago to dispel the myth that my house is “perfect.” In sharing the honesty of the situation… I hope it helps me try to improve my rooms. 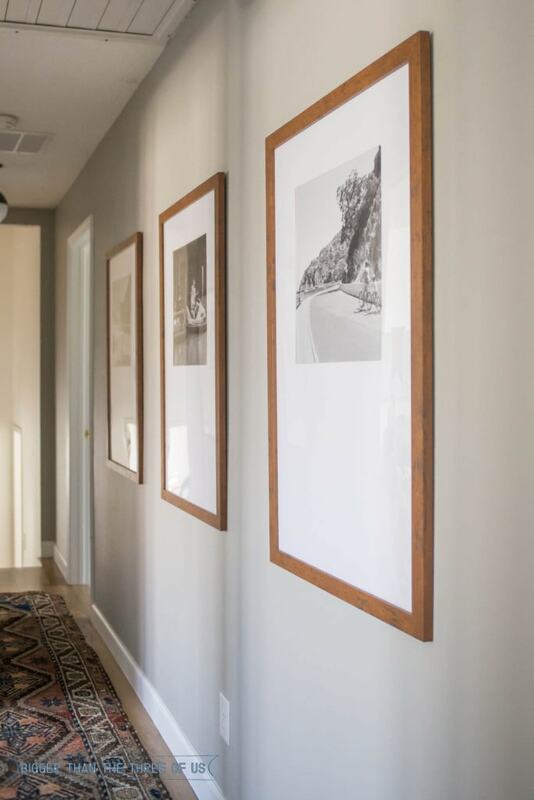 So, today’s post is all about the Travel Gallery Hallway Issues; and let me tell you, there are quite a few issues that needed to be tackled. I’m sure, as you read this, you’ll relate to some of these. The hallway has had certain “issues” for quite some time. 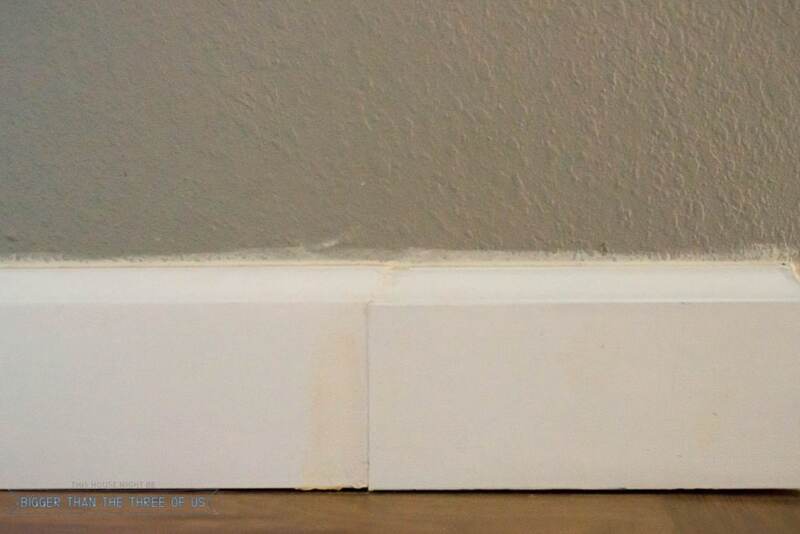 The baseboards had a scarf joint that didn’t quite mesh up as well as I hoped for and my caulking job was not the best. So, we needed some pretty major sanding and paint touch-up work to say the least. Then, when I painted the hallway, 5+ years ago, I threw away the dingy cover for the attic fan switch and never put another cover up. So, you know, one of the thousands of times that I’m at the hardware store… I could have easily picked up a $2 cover but never once did I do that. The space needed a few other paint touch-ups and it needed a rug pad. 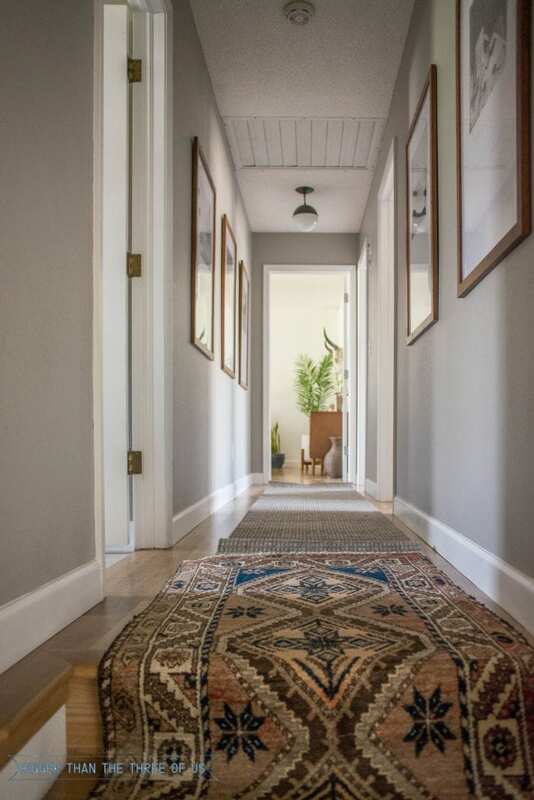 The runner that we have in the hallway is great but it does slide a bit so a rug pad was in order. So, you see… lots of minor issues but none that were high-up on the priority list. I’m sure you all have things very similar to this. 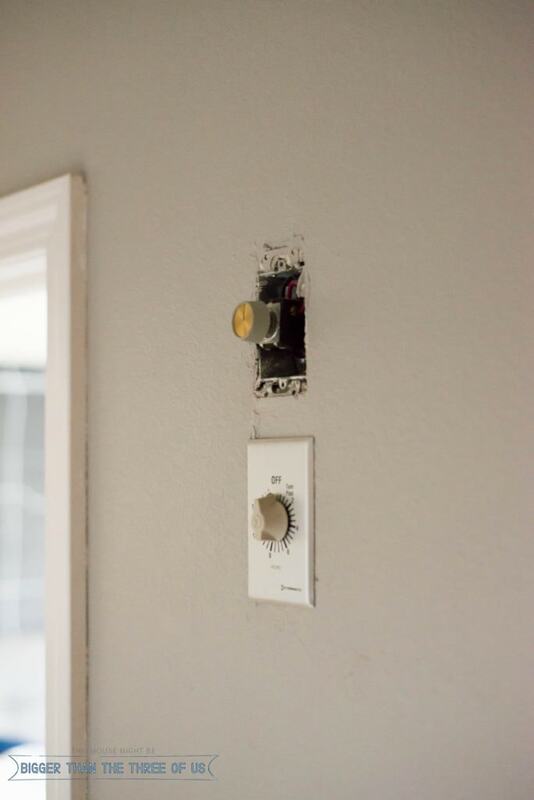 So sometimes, it helps to just decide to fix these things and that’s what today is about: sharing the “behind the scenes” of a room that looks to be finished and done yet when you really look… there’s a few things that really need to be taken care of. 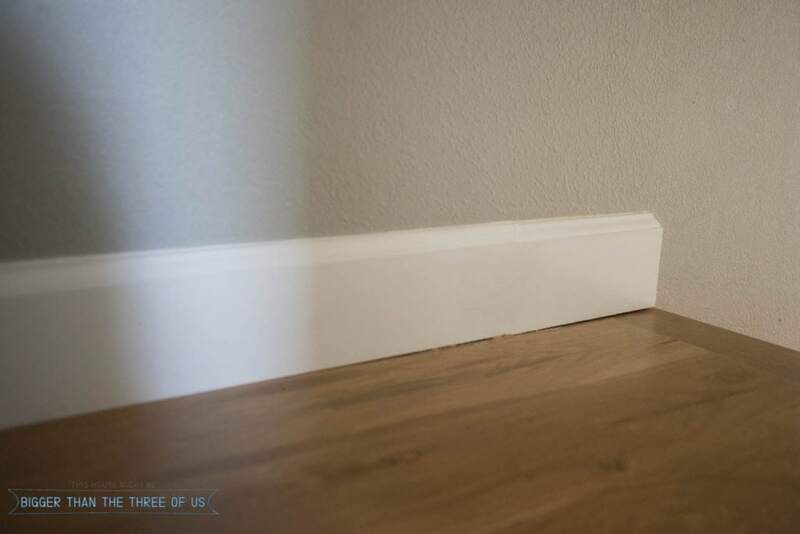 So, first things first, we got on sanding that irregular baseboard. I sanded a few times and then Luke thought it needed some wood filler. We added wood filler, let it dry and then lightly sanded again. Luke came back over the top of it with fresh paint and then touched up the caulking job so that we had a clean line of gray along the top. It’s not perfect, but it’s so much better! Then, I went online and purchased a rug pad. I really like Rug Pad Corner (not sponsored or anything). I think the selection, what they offer and the price point is just right. The rug pad came and I unrolled it and then started to pull the Persian runner on top of it, but then I totally got sidetracked. 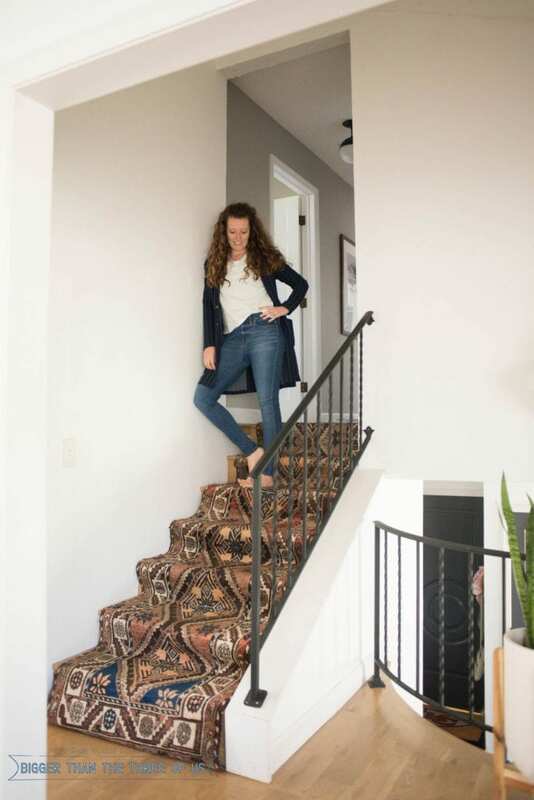 Look how amazing a vintage runner would look on my stairs! Seriously, it’s really good, right?! It’s not going to happen, but it’s always fun to see your home in a different way. But, anyways, the rug pad fit perfectly under the runner. I didn’t mention anything to Luke about the pad but he noticed the first night. It’s so squishy and soft. The best part of the rug pad is that it has officially stopped the rug from sliding around. Oh and in case you are wondering, I’m still in love with my travel gallery wall in the hallway. If you missed it, check out my post on how to cut your own picture mats. After the rug pad, I picked up a simple cover for the attic fan switch and put that in. Easy peasy! None of the travel gallery hallway issues were expensive or a huge time investment. 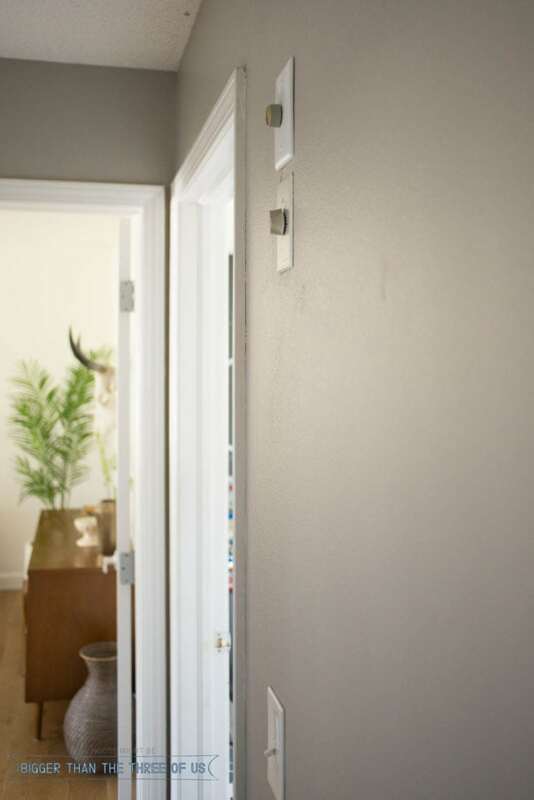 It just required me to focus on one spot in my house and actively try to improve that area. Sometimes, I think the focusing on one room can be hard but it feels so good to actually just focus and get it done. Hopefully, they will inspire you to tackle something “ugly” in your house and just get ‘er done.